How common and how serious is oral cancer? Oral cancer, the sixth most common cancer, accounts for about 3.6 percent of all cancers diagnosed, with roughly 40,000 new cases of oral cancer reported annually in the United States. The vast majority of oral cancers occur in people older than 45 years, with men being twice as likely as women to develop the disease. The most frequent oral cancer sites are the tongue, the floor of the mouth, soft palate tissues in back of the tongue, lips, and gums. If not diagnosed and treated in its early stages, oral cancer can spread, leading to chronic pain, loss of function, irreparable facial and oral disfigurement following surgery, and even death. Your general dentist can perform a thorough screening for oral cancer. Scientists aren't sure of the exact cause of oral cancer. However, the carcinogens in tobacco products, alcohol and certain foods, as well as excessive exposure to the sun have been found to increase the risk of developing oral cancer. Risk factors for oral cancer may also be genetically inherited. What are the warning signs to watch out for? Oral cancer-represented by red, white or discolored lesions, patches or lumps in or around the mouth-is typically painless in its early stages. As the malignant cancer spreads and destroys healthy oral tissue, the lesions or lumps become more painful. However, oral cancer is sometimes difficult to self-diagnose so routine dental exams are recommended. See your dentist immediately if you observe: any sore that persists longer than two weeks; a swelling, growth or lump anywhere in or about the mouth or neck; white or red patches in the mouth or on the lips; repeated bleeding from the mouth or throat; difficulty swallowing or persistent hoarseness. How does a dentist screen for oral cancer? Your dentist should screen for oral cancer during routine checkups. He or she feels for lumps or irregular tissue changes in your neck, head, cheeks and oral cavity, and thoroughly examines the soft tissues in your mouth, specifically looking for any sores or discolored tissues. If your dentist suspects oral cancer, a biopsy of the lesion is required to confirm the diagnosis. Surgery is required to remove the tumors, which may cause disfiguration. Radiation therapy may be used as part of the treatment. What can I do to prevent oral cancer? Oral cancer accounts for roughly 9,000 deaths annually (about 3 percent of all cancer-caused deaths). Of all major cancers, oral cancer has the worst five-year survival rate at about 54 percent. Because oral cancer is usually not diagnosed in its early stages, less than half of all oral cancer patients are cured. You can help prevent oral cancer by not smoking, using spit tobacco, or drinking excessive alcohol. When tobacco use and alcohol use are combined, the risk of oral cancer increases 15 times more than non-users of tobacco and alcohol products. Research suggests that eating plenty of fruits and vegetables may safeguard against oral cancer. Because successful treatment and rehabilitation are dependent on early detection, it is extremely important to see your dentist for an oral cancer screening and regular checkup at least every six months. Survival rates greatly increase the earlier oral cancer is discovered and treated. During your next dental visit, ask your dentist to do an oral cancer screening. Sources: American Cancer Society; Luke F. Matranga, DDS, MAGD, CBGD, past president of the AGD; "The War on Oral Cavity and Pharyngeal Cancer,' by Dr. Harold Slavkin, JADA, April 1996; "U.S. 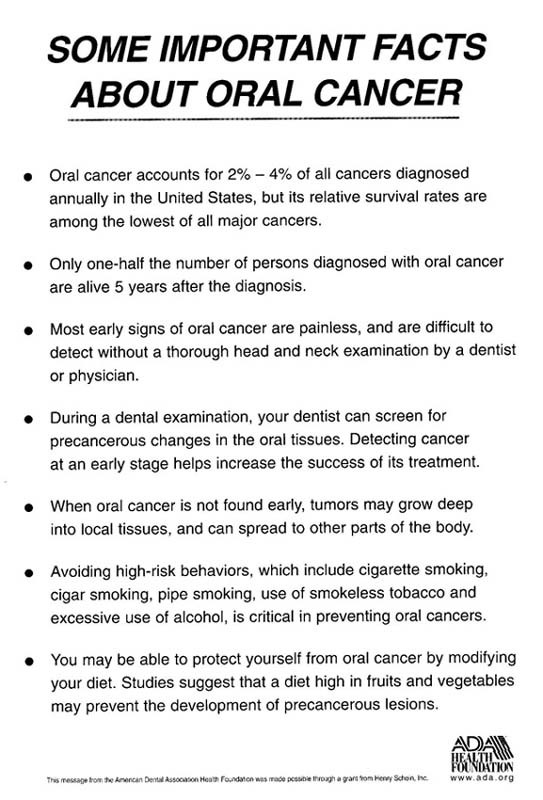 Adult Knowledge of Risk Factors and Signs of Oral Cancers: 1990," by Dr. Alice Horowitz, et. al., JADA, January 1995; "The Early Warning Signs of Oral Cancer, by Edmund Cataldo, Dental Hygienist News, Spring 1994. This information was compiled for you by the Academy of General Dentistry. Your dentist cares about long-term dental health for you and your family and demonstrates that concern by belonging to the Academy of General Dentistry. As one of the 35,000 general dentists in the United States and Canada who are members of the Academy, your dentist participates in an ongoing program of professional development and continuing education to remain current with advances in the profession and to provide quality patient treatment.